I've recently bought a Pimoroni Unicorn Hat for my daughter to use on her Raspberry Pi. 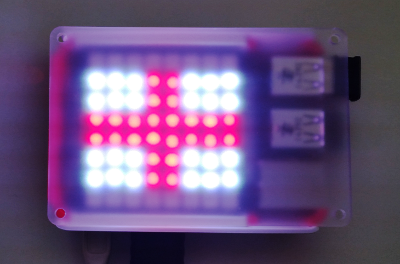 It's a add-on for the Raspberry Pi which provides 64 LEDs each of which can be individually set to any colour. As it's St George's day I've created a St George's cross. The photo is shown through a diffuser as the LEDs are very bright for a photo. Programming is easy using the supplied Python libraries. First install the python libraries following the instructions here: Pimoroni Unicorn Hat.